Imagine opening your email to find several emails from companies selling you services that are completely irrelevant to your business. I’m sure it’s happened before. And it will certainly happen again. Now remember how frustrated you were to have to go through and delete these irrelevant emails. Don’t be like these annoying businesses. Your prospects will feel the same way if you bombard them with irrelevant material. Not to mention you are wasting your own time and resources on unqualified prospects. Here’s where using an integrated marketing campaign would have benefitted. Integrated marketing, like inbound marketing, is all about the customer. It’s about targeting the right prospect with a message that is valuable, informative, and above all else, remarkable. An integrated marketing campaign utilizes all available resources and coordinates their efforts to achieve a more effective, consistent message to prospects. 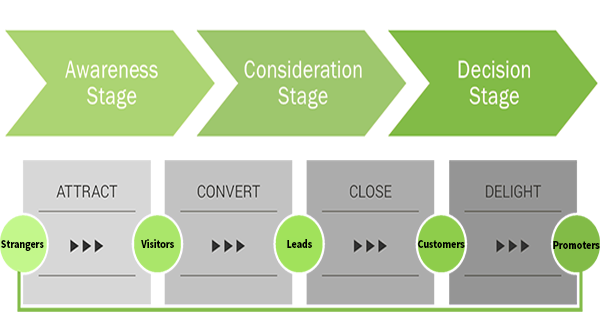 To successfully integrate your marketing campaign with inbound marketing, you must constantly keep in mind where your prospect is in the buyer’s journey as it relates to the inbound marketing methodology (see below). Then, you can target your prospect with specifically formulated content for each stage. Let’s delve a little further into how to develop a successful integrated marketing campaign with five steps to follow. You can’t hope to target the right customer if you don’t know who the right customer is. Makes sense. The first step is to create detailed buyer personas that identify key demographics and other information about your prospect. You should find out their challenges and goals, as well as their watering holes—where they gather their news or important industry information. Use our buyer persona template to help get you started. After you have identified your buyer personas, you should be able to identify where they go for information. Are they on Twitter? LinkedIn? If you’re a B2B company, you should definitely be utilizing the power of these two social media platforms. -How will this help my customer? -What value does this offer bring to my customer? -Does this information provide educational and engaging information for my customer? You’ve spent all this time making it, now get it out there for your prospects to find! Distribution is equally important as creating content, and aligns with the mission of integrated marketing—getting your content found. This brings us back to Step 2. Target their watering holes. If your B2B prospects are in LinkedIn groups, find out which groups and interact with them there. If they are on Twitter, follow them. Highlight your content on these outlets as well as your own website and blog. Enable social media share buttons on each blog post you write so that your prospects can share with their followers. Creating an alignment between sales and marketing in your company is one of the most important steps of inbound marketing. The collaboration between these two teams is essential in developing targeted campaigns for new leads. Sales insights generated through inbound marketing efforts allows more qualified, sales-ready leads to be passed through the inbound methodology, ultimately leading to more customers. Marketing can better enable sales with the right tools for successfully selling to their prospects and closing more deals. Creating an integrated marketing campaign for your company is a marathon, not a sprint. Keep in mind that your efforts must be continual in order to reach more prospects. Marketing in itself is constantly evolving. Is your company evolving and aligning your goals around your customer?